1) What is your inspiration as a writer? Growing up horror was far more shocking than it has been in the more recent releases. The stories of yesteryear left you running to your bed after turning the light out, just to get your feet off the floor. Then you were convinced that something was lurking in the dark waiting to catch you off guard. Feeling the intensity and shock delivered during the unfolding of a story is the most inspiring of all; knowing the unsuspecting person on the other end, the potential fan reading a story for the first time will experience the very same shock. 2) Why did you choose short fiction? I write long fiction as well as short. I choose to write short fiction as a “quick fix” for my favorite genre (horror). A full length horror book is wonderful. However, sometimes we need something short but satisfying; a shock to the system that leaves us feeling jolted; a short story with the shockwaves of a long one. 3) Characters, plot, writing style: Put these in order of most to least importance, and tell us why you think this. First: Writing style- with no writing style the plot and characters are just concepts. The writing style will determine a lot about the character and plot. With no style, the story cannot begin. Second: Plot- with no plot your character is has no place to exist, nowhere to go, no one to know he/she even exits. The character cannot exist without a plot. Third: Character- when a story begins nothing is known about the character. A brief summary of his/her ‘character’ maybe given in the beginning or the reader may be guessing about the finer details of that same personality far into the book. It could also be said that a plot cannot exist without a character. Without a character, the plot will have no reason to exist. I disagree. The plot is to a book as space and time are to reality. As the pages of a story turn the plot exists as does space and the pages progress time. The character, like a nonfictional person in the space/time we call reality, walks from page to page until finally reaching the end. 4) Do you believe in writing every day, or in writing whenever inspiration knocks on your door? Both. I make sure to write at least a few paragraphs when I find myself with some extra time. I also find myself waking in the night and writing on current projects or entirely new stories before I’m awake enough to know I’m writing. 5) Any advice for aspiring short fiction authors? Don’t expect fireworks. Your first book will probably get little or no attention. Keep writing, someone out there will read your book(s) and you will be their favorite author. If you give up and quit writing, you fan will be very disappointed; if you keep writing, they will have something to talk about and more people will read your work. 6) What do you think the biggest challenges are when writing short fiction? The biggest challenge to writing short fiction is the first four paragraphs. It’s like moving a boulder; hard to get it started, but once it’s rolling, nothing can stand in your way. 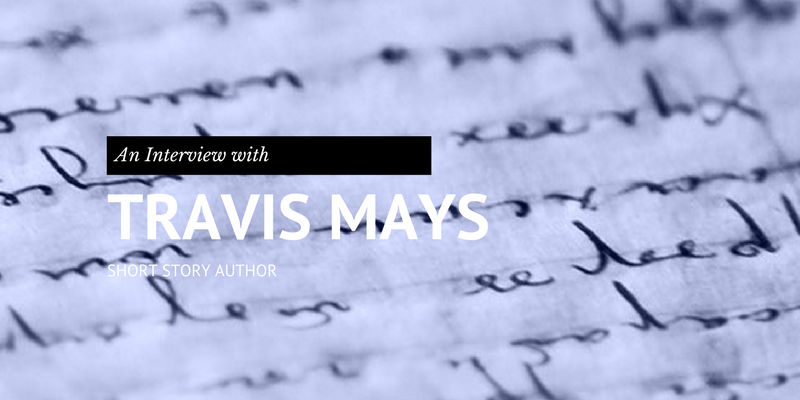 Travis Mays is an indie-author who lives in the woods. He is a writer of fiction (horror books and short stories) as well as some nonfiction. You can purchase his books here.